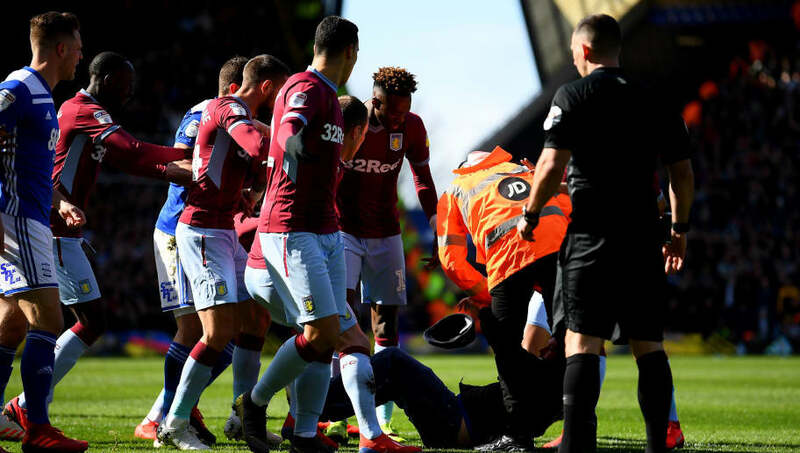 ​A man has been charged by police after attacking Aston Villa midfielder Jack Grealish during the side's Championship clash with Birmingham City, whilst a separate incident involving a steward has now come to light. The England Under-21 international was the subject of an attack by a fan who came on to the pitch 10 minutes into the start of Sunday's derby match and punched Grealish in the neck. CHARGED: We've this evening (Sun 10 March) charged a man with invading the pitch and assaulting Aston Villa player Jack Grealish during the Second City derby. West Midlands police have confirmed via ​Twitter that the attacker, 27-year-old Paul Mitchell, has been charged with encroachment on to the pitch and assault, and is due to appear at Birmingham Magistrates' Court on Monday. Following the attack, the Football Association revealed that it 'strongly condemned the incident', and that they would be 'working with the police, relevant authorities and the club to ensure the appropriate action is taken'. In a separate unsavoury incident in the second half, ​The Sun report that a steward was removed from St Andrew's by police after it appeared that he pushed and kneed Grealish during the midfielder's goal celebrations. After scoring his 67th minute winner, the 23-year-old rushed over to the away fans to celebrate, and in footage captured of the incident, the steward seems to shove the ​Villa star into a cameraman, before kneeing him in the back. Police could then be seen confronting the individual before leading him away down the tunnel, with Grealish's teammate Tyrone Mings angrily arguing with the steward after the altercation. It is still unclear whether Birmingham City will face any punitive action for Sunday's incidents, however they have ​issued an apology and confirmed that the fan who attacked Grealish will be banned for life. "We deplore the behaviour of the individual who committed this act and rest assured he will be banned from St. Andrew’s for life," read the official statement. "The Club will also support any further punishment this individual may face in the eyes of the law. "What happened has no place in football or society. Jack is a ​Birmingham lad and regardless of club allegiance should not have been subjected to this – there are no excuses."